Paul Josef Cardinal Cordes, the president of the Pontifical Council Cor Unum and a close friend of Pope Benedict XVI, offers a wide-ranging view of the priesthood that draws on the Holy Father’s thinking and scholarship over a period of fifty years. 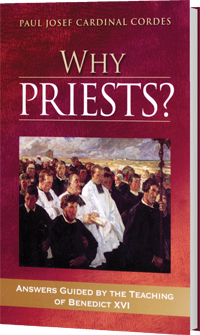 The book covers four major themes: origins of priesthood, development through the history of the Church, the limitations and problems faced by priests, and personal faith and the Church’s salvific means. Through these reflections Cardinal Cordes offers a deeper understanding of the Catholic priesthood that is sure to be helpful for the priest and his parish, the seminarian in his formation, as well as all those interested in the priestly ministry and the Church’s decision-making process.